Fishing season has begun in New Mexico — time for anglers to get a new license and enjoy all the fun! Anglers can expect good fishing in many waters this year, with many streams now carrying plenty of spring runoff from the state’s modest mountain snowpack. Anglers are reminded to purchase a new fishing license before setting out for their favorite fishing hole. The fishing license year runs from April 1 to March 31 and licenses cost $25 for state residents. Most anglers also are required to purchase a $4 state habitat management and access validation stamp, and anglers intending to fish on Bureau of Land Management or U.S. Forest Service lands also need a $5 federal habitat stamp. Habitat stamps help fund fish habitat improvement projects around the state that provide anglers more opportunities to catch great fish. Children younger than 12 do not need a license to fish, and anglers age 70 and older qualify for a free license. Disabled military veterans and active-duty members of the armed forces qualify for free or discounted licenses. 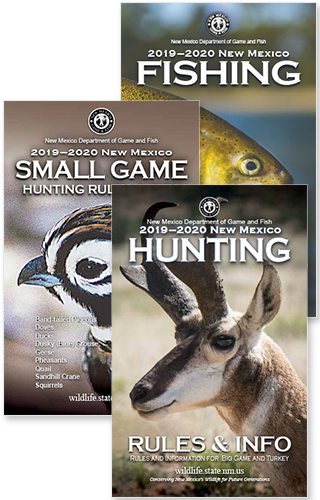 Consult the current fishing rules and information booklet, available online at www.wildlife.state.nm.us or at local license vendors for more details. Anglers can purchase their new license online at onlinesales.wildlife.state.nm.us, at a participating license vendor or by calling the department toll free at (888) 248-6866. Anglers can expect to find good fishing this spring at many reservoirs and lakes that have filled up after good monsoon rains last summer and fair mountain snowpack this winter, Frey said. “Conchas Lake is looking great right now with the water clear and clean and the bass fat, happy and hungry,” Frey said. Santa Rosa Lake is recovering nicely after several years of ill effects from the ongoing drought, Frey said. “We’re seeing some young smallmouth bass and crappie that have spawned there and that’s a good sign that the lake is on the rebound,” he said. Clayton Lake in the northeast corner of the state is in good shape and always is a great spot for chasing potential record-breaking walleye, good-sized bass and plenty of stocked trout, Frey said. Caballo Lake in the south central portion of the state is a good place to pursue those fish too, he said. Stream and river anglers will find waters in the Jemez Mountains some of the first to clear up and come down from spring runoff. The area received much-needed snow this past winter and anglers should find fishing conditions have improved. For more information about fishing conditions around the state, consult the fishing and stocking report at www.wildlife.state.nm.us/fishing/weekly-report/.